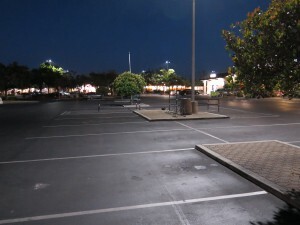 Retail parking lots are tough to light: crisp enough to bring in customers, safe maneuvering for pedestrians and cars, minimizing dark areas where unwanted activities can happen all while providing energy efficient, environmentally friendly lighting. King’s Plaza shopping center on the corner of 41st Avenue and Capitola road did that with their recent conversion to LED lighting. The lots eighteen 250 Watt (HPS) High Pressure Sodium (the yellowish street and area lights commonly seen) lights were replaced with 150 W LED lights. This saves 1,800 Watts or 1.8kW/ hour of operation for the lot. The U.S. Energy Information Agency calculations each kWh of electricity saved keeps between 1.22 and 2.19 lbs of CO2 from being released. For an average 12 hours of operation the lot is saving 21.6kW of electricity and approximately 26 lbs of CO2 with this conversion. The lights are from RAB lighting. 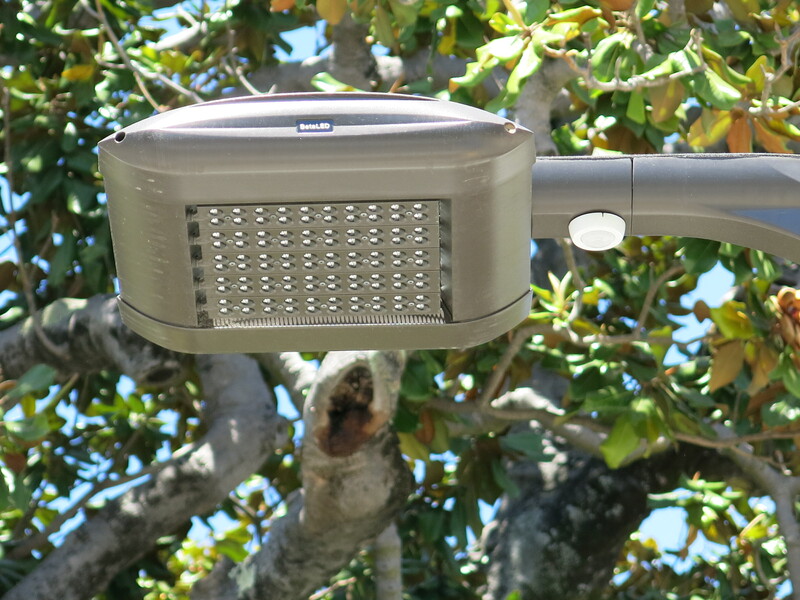 The most notable thing about the lights are that they do not have the array of LEDs typically seen on LED roadway and area luminaires. 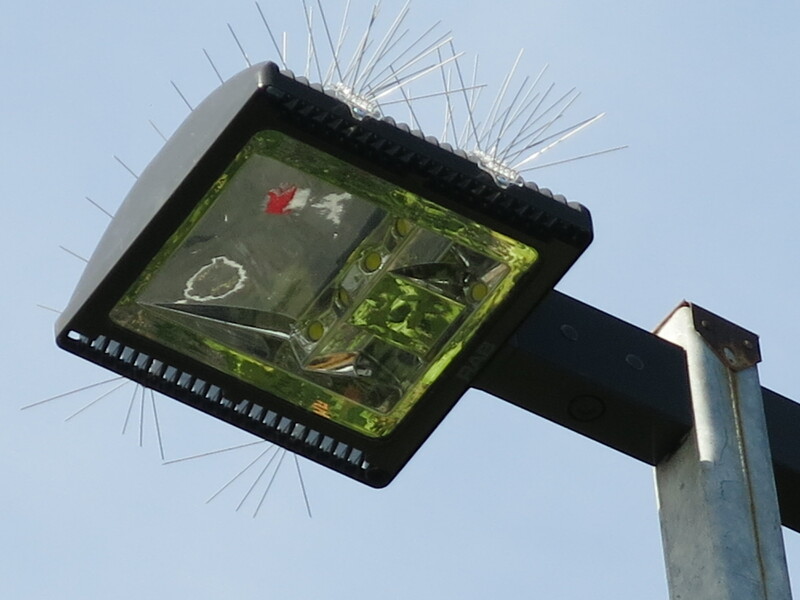 Nor do they have the presence detection sensor seen on other lights like the Church street lights or the photocell seen on the top of other outdoor lights. These lights are all controlled by a timer. 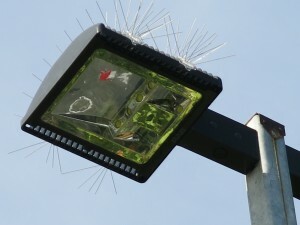 In this design the LEDs are the yellow areas tucked up in the back of the light. We’ve seen this style of light in other areas along 41st Avenue. This style works by collecting and reflecting the light rather than the direct illumination in the array style light. Specs: -5000K color temperature – tends toward whiter light. This was discussed in earlier posts. Type III light distribution as defined by IESNA. 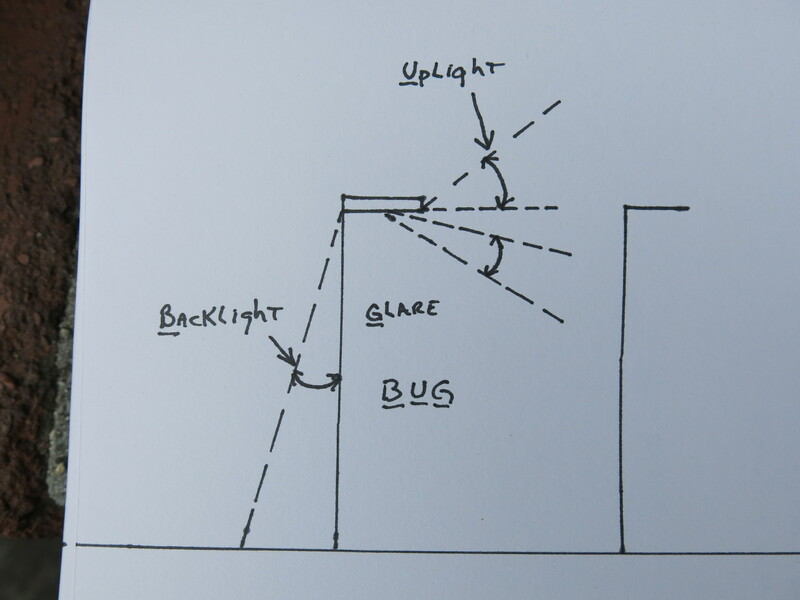 The type III light distribution throws the light wide and deep as seen in the top photo. 80.8 lm/W (lumens per watt) which is the efficacy of the light or how effectively it converts electricity (W) into light (lm) lumens. The Color Rendering Index of 65 works well enough for a parking lot. 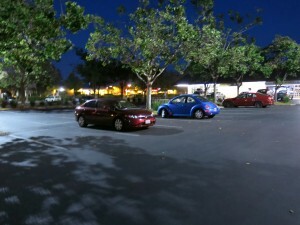 In this photo taken with only the parking lot lighting the colors are well rendered enough to discriminate between different colored cars. Note the vertical lighting ability to clearly illuminate the license plates. 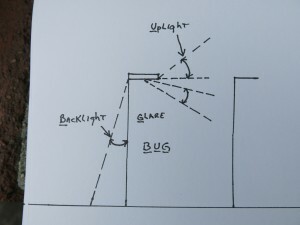 BUG stands for Backlight, Uplight and Glare and the rating numbers assign a ranking to each attribute from 0-5 with 0 being the best or lowest amount of light emitted in that attribute as these are areas in which light is unwanted. 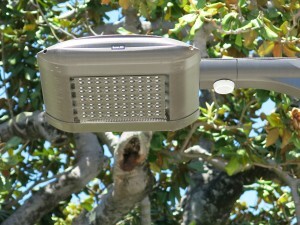 Rebates are available from PG&E for these lights. 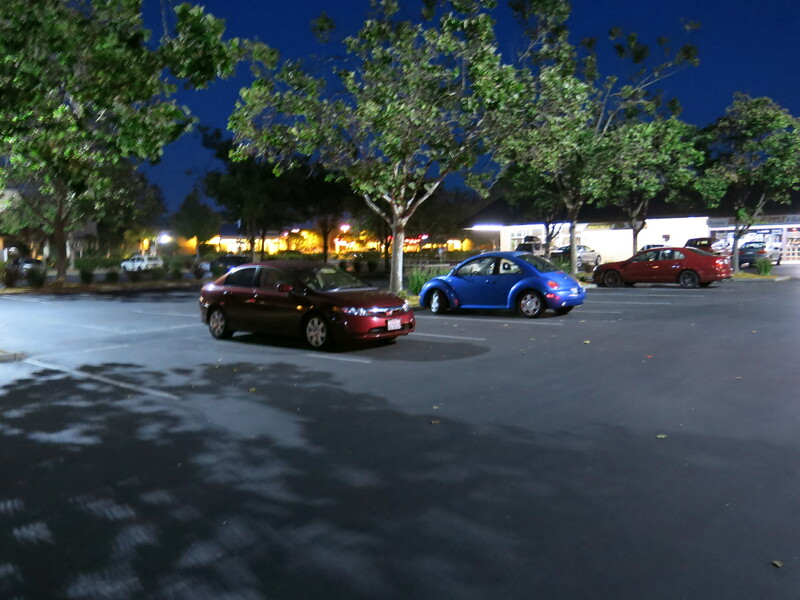 The rebate for replacing HID exterior area lights with 150-192W LED lighting in rebate code LT001 is $80/ light.